For the actress, see Diana Churchill (actress). 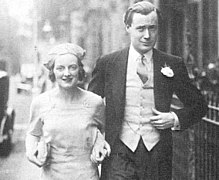 Diana Churchill with her then husband Duncan Sandys in 1935. Diana Spencer-Churchill (11 July 1909 – 20 October 1963) was the eldest daughter of British statesman Sir Winston Churchill and Clementine Churchill, Baroness Spencer-Churchill (née Hozier). She attended Notting Hill High School and then the Royal Academy of Dramatic Art, where she spent five terms, although her focus was not on acting. On 12 December 1932, she married John Milner Bailey (15 June 1900 East Grinstead – 13 February 1946 Cape Town, South Africa) (became the Bailey baronet Sir John Milner Bailey, 2nd Bt), but the marriage was unsuccessful and they divorced in 1935. On 16 September 1935, she married the Conservative politician, Duncan Sandys (later life peer Lord Duncan-Sandys). After having three children, that marriage also ended and they were divorced in 1960. On 11 April 1962, her name was legally changed back to Diana Churchill. The Honourable Edwina Sandys (b. 29 December 1938); she married Piers Dixon in 1960 and divorced in 1973. They have two sons. She married Richard D. Kaplan in 1985. The Honourable Celia Sandys (b. 18 May 1943); she married Michael Kennedy in 1965 and divorced in 1970. They have one son. She remarried Sir Dennis Walters in 1970 and were divorced in 1979. They have one son. She remarried Maj.-Gen. Kenneth Perkins in 1985. They have two children. She was an officer in the Women's Royal Naval Service during the Second World War. Diana had several nervous breakdowns. In 1962, she began working with the Samaritans, an organisation created for suicide-prevention. In 1963, she died, at age 54, from an overdose of barbiturates. A coroner later concluded that the death was a suicide. She is buried with her parents (who both outlived her) and siblings at St Martin's Church, Bladon, near Woodstock, Oxfordshire. ^ Lovell, Mary S. (2012). "1932-7 Changes at Blenheim". The Churchills: a family at the heart of history – from the Duke of Marlborough to Winston Churchill. London: Abacus. ISBN 9780349119786. ^ "Diana Churchill". rada.ac.uk. Royal Academy of Dramatic Art. Retrieved 22 July 2016. ^ "Houston City Scope: Sir Winston Churchill offspring born in Houston". Houston Lifestyles & Homes. May 2014. Retrieved 20 December 2016. ^ "Mrs. Diana Churchill "Suicided"". The Age. 25 October 1963. Retrieved 6 August 2009. This English biographical article related to the military is a stub. You can help Wikipedia by expanding it. This page was last edited on 3 March 2019, at 21:47 (UTC).